Apple claims that its Apple Watch can detect atrial fibrillation (AF) and appropriately notify the wearer when it suspects AF. Apparently it needs to record 5 instances of irregular heart beat characteristic of atrial fibrillation over at least 65 minutes before making the notification. 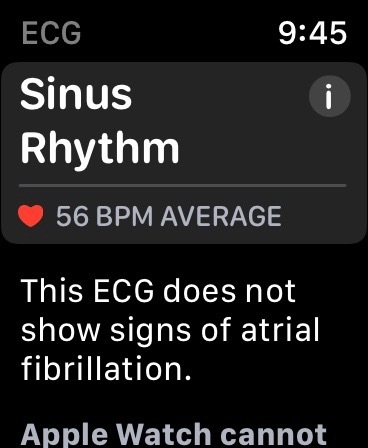 This feature utilizes the watch’s optical heart sensors, is available in Apple Watch Series 1 or later and has nothing to do with the Apple Watch 4 ECG recording capability which I described in detail in my prior post. A patient of mine with known persistent AF informed me yesterday that she had gone into AF and remained in it for nearly 3 hours with heart rates over 100 beats per minute and had received no notification. She confirmed the atrial fibrillation with both AW4 recordings and AliveCor Kardia recordings while she was in it. The watch faithfully recorded sustained heart rates up to 140 BPM but never alerted her of this even though the rate was consistently over her high heart rate trigger of 100 BPM. 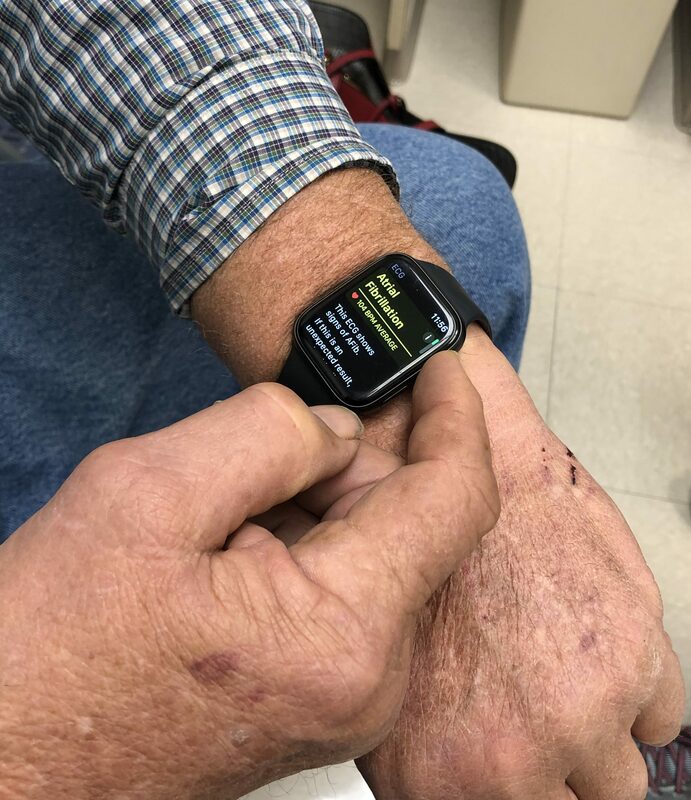 The patient had set up the watch appropriately to receive notifications of an irregular rhythm. Reviewing her tracings from both the AW4 and the Kardia this was easily diagnosed AF with a rapid ventricular response. What does Apple tell us about the accuracy of the Apple Watch AF notification algorithm? All we know is the unpublished , non peer-reviewed data they themselves collected and presented to the FDA. This tells us that about 80% of notifications are likely to be Afib whereas 20% will not be Afib. It is unclear what the “other clinically relevant arrhythmias” might be. If I had to guess I would suspect PVCS or PACS which are usually benign. 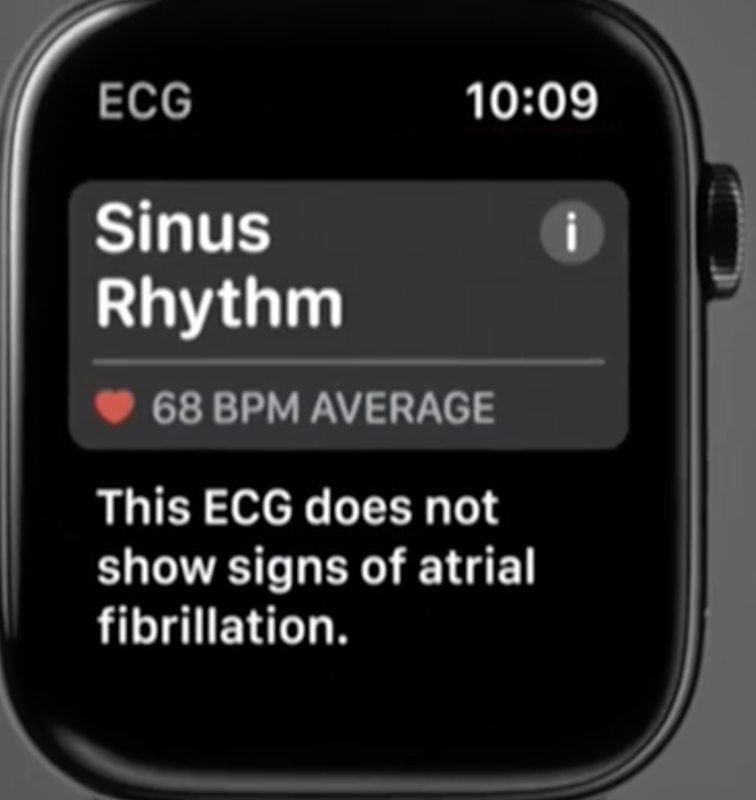 If 20% of the estimated 10 million Apple Watch wearers are getting false positive notifications of afib that means 2 million calls to doctor or visits to ERs that are not justified. This could be a huge waste of resources. Thus the specificity of the AF notification is 80%. The other important parameter is the sensivitiy. Of the cases of AF that last >65 minutes how many are detected by the app? Apple doesn’t seem to have any data on that but this obvious case of rapid AF lasting for 3 hours does not give me much confidence in their AF detection algorithms. It is not intended to provide a notification on every episode of irregular rhythm suggestive of AFib and the absence of a notification is not intended to indicate no disease process is present; rather the feature is intended to opportunistically surface a notification of possible AFib when sufficient data are available for analysis. These data are only captured when the user is still. Along with the user’s risk factors, the feature can be used to supplement the decision for AFib screening. The feature is not intended to replace traditional methods of diagnosis or treatment. 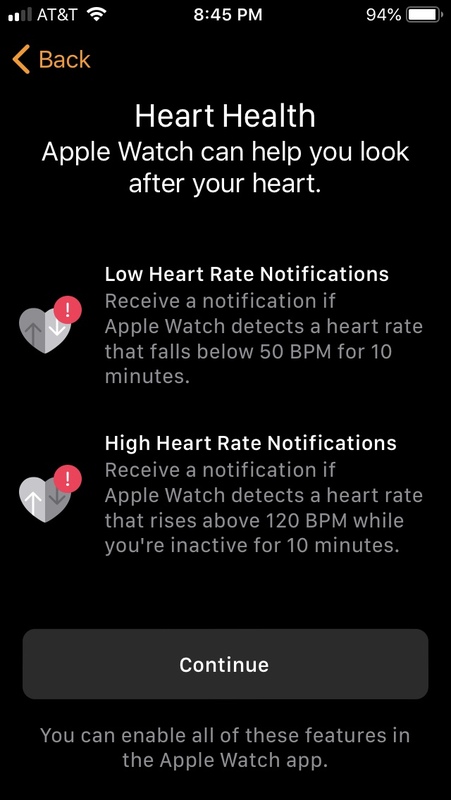 My patient took her iPhone and Apple Watch into her local Apple store to find out why her AF was not detected. She was told by an Apple employee that the Watch does not detect AF but will only notify her if her heart rate is extremely low or high. I had asked her to record what they told her about the problem. As I’ve written previously (see here) the Apple Watch comes with excessive hype and minimal proof of its accuracy. I’m sure we are going to hear lots of stories about AF being detected by the Watch but we need some published, peer-reviewed data and we need to be very circumspect before embracing it as a reliable AF monitor. My first patient this morning, a delightful tech-savvy septagenarian with persistent atrial fibrillation told me she had been monitoring her rhythm for the last few days using her Apple Watch 4’s built in ECG device. 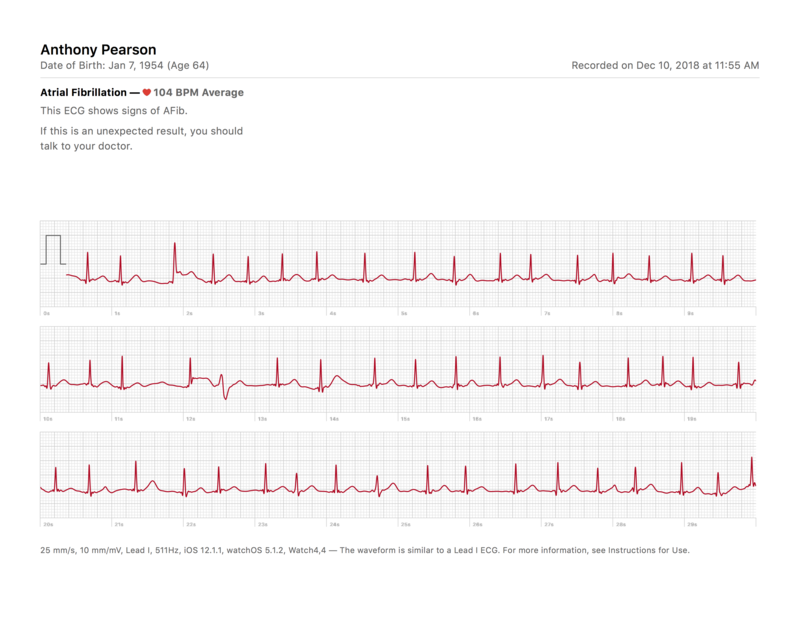 Previously she had been using what I consider the Gold Standard for personal ECG monitoring- AliveCor’s Kardia Mobile ECG and I monitored her recordings through our Kardia Pro connection. I had been eagerly awaiting Apple’s roll out since I purchased the AW4 in September (see here) and between patients this morning I down-loaded and installed the required iPhone and Watch upgrades and began making AW4 recordings. Through the day I tried the AW4 and the Kardia on patients in my office. The AW4 ECG recording process is very easy and straightforward. 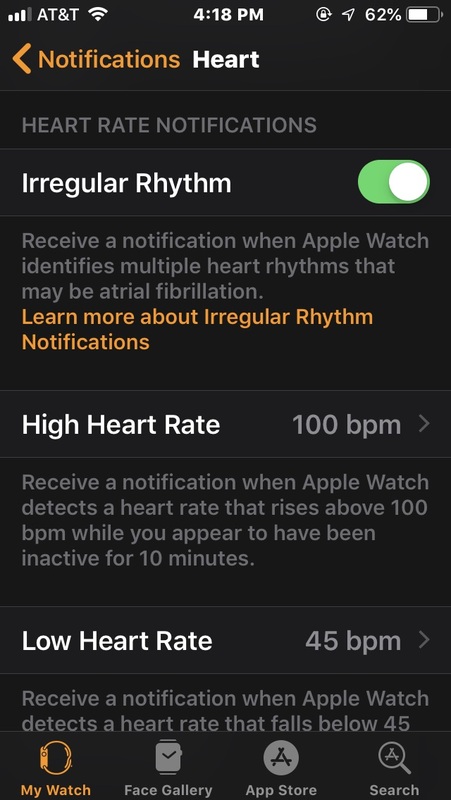 Upon opening the watch app you are prompted to open the health app on your iPhone to allow connection to the Watch ECG information. After this, to initiate a recording simply open the Watch ECG app and hold your finger on the crown. Immediately a red ECG tracing begins along with a 30 second countdown. Later in the day I had a few patients with permanent atrial fibrillation put on my watch. 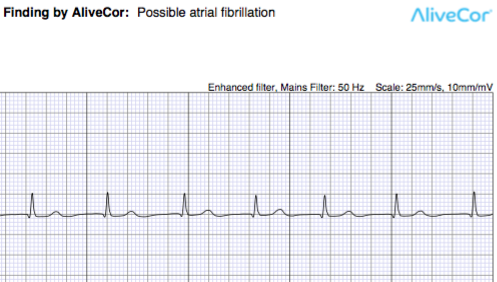 The AW4 nailed the diagnosis as atrial fibrillation. After you’ve made an AW4 recording you can view the PDF of the ECG in the Health app on your iPhone where all of your ECGs are stored. The PDF can be exported to email (to your doctor) or other apps. ECG of the Bowling Green farmer. I am not in afib. The Kardia device and algorithm despite a fairly noisy tracing was able to correctly diagnose atrial fibrillation in this same patient. I put the AW4 on Sandy, our outstanding echo tech at Winghaven who is known to have a left bundle branch block but remains in normal rhythm and obtained this inconclusive report . Despite adjustments to her finger position and watch position, I could not obtain a reasonble tracing with the AW4. The Kardia tracing is fine, no artifact whatsoever. What can we conclude after today’s adventures with the Apple Watch ECG? This is an amazingly easy, convenient and straightforward method for recording a single channel ECG. Based on my limited sample size today, however, the AW4 has a high rate of being uncertain about diagnoses. Only 2/3 cases of permanent atrial fibrillation were identified (compared to 3/3 for the Kardia) and only 4/6 cases of sinus rhythm were identified. If those numbers hold up with larger numbers, the AW4 is inferior to the Kardia ECG device. I’d rather see the AW4 declare inconclusive than to declare atrial fibrillation when it’s not present but this lack of certainty detracts from its value. What caused the bizarre artifact and inconclusive AW4 tracing in my patient is unclear. If anybody has an answer, let me know. We definitely need more data and more studies on the overall sensitivity and specificity of the AW4 and hopefully these will be rapidly forthcoming. For most of my patients the advantages of the AW4 (assuming they don’t already have one) will be outweighed by its much greater cost and we will continue to primarily utilize the Kardia device which will also allow me to view all of their recordings instantaneously in the cloud. 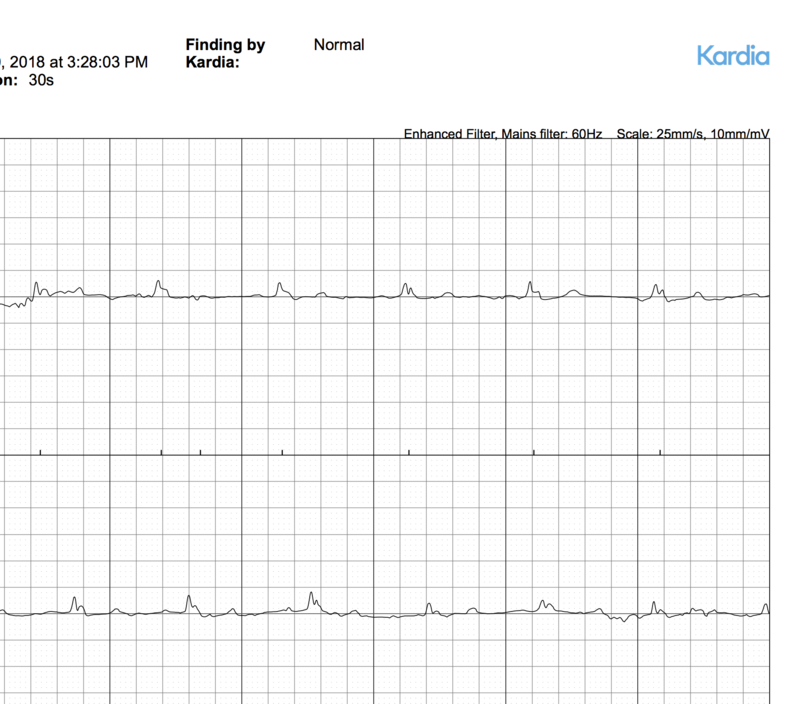 I described in detail in March (see here) my early experience in utilizing AliveCor’s KardiaMobile ECG device in conjunction with their Kardia Pro cloud service to monitor my patient’s with atrial fibrillation (afib). Since that post the majority of my new afib patients have acquired the Kardia device and use it regularly to help us monitor their afib. This capability has revolutionized my management of atrial fibrillation. 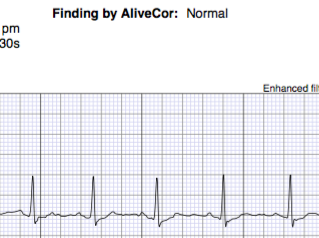 In those patients who choose to use AliveCor there is really no need for long-term monitors (Holter monitors, Zio patches, cardiac event monitors) and no need for patients to come to the office to get an ECG when they feel they have gone into afib. When one of my Kardia Pro patients calls with symptoms or concern of afib, I quickly pull up their chart at Kardiapro.com and review their recordings to determine if they are in or out of rhythm. Most treatment decisions can then be handled over the phone without the need for ordering a monitor or an emergency room or office visit. Tuesdays I spend the day working in the heart station at my hospital. Typically, on these days I will supervise stress tests, read ECGs and echocardiograms, perform TEES and electrical cardioversions. On a recent Tuesday I had 3 patients scheduled for cardioversion of their atrial fibrillation. The day before one of these patients called indicating that he suspected he had reverted back to normal rhythm (NSR) based on his Kardia readings. He had had a prior cardioversion after which we know (thanks to daily Kardia recordings) he reverted to afib in 5 days. Subsequently we had started him on flecainide, a drug for maintenance of NSR and scheduled him for the cardioversion. Not uncommonly after starting flecainide patients will convert to NSR but if they don’t we proceed to an electrical cardioversion. I logged into KardiaPro and reviewed his dashboard and sure enough his last two ECGs showed sinus rhythm. I congratulated him on this and we canceled his cardioversion for the next day, saving the lab the time and expense of a cancellation the day of the procedure. The patient avoided much stress, time and inconvenience. ECG recordings showing the patient had transitioned from afib (bottom two panels) to NSR (top two panels) after starting flecainide. It is important to note that in this patient there was no great jump in heart rate with afib compared to NSR. For many patients the rate is much higher with the development of afib and this is often detected by non ECG wearable monitors (like an Apple Watch.) But for patients like this one, an ECG is the only way to know what the rhythm is. 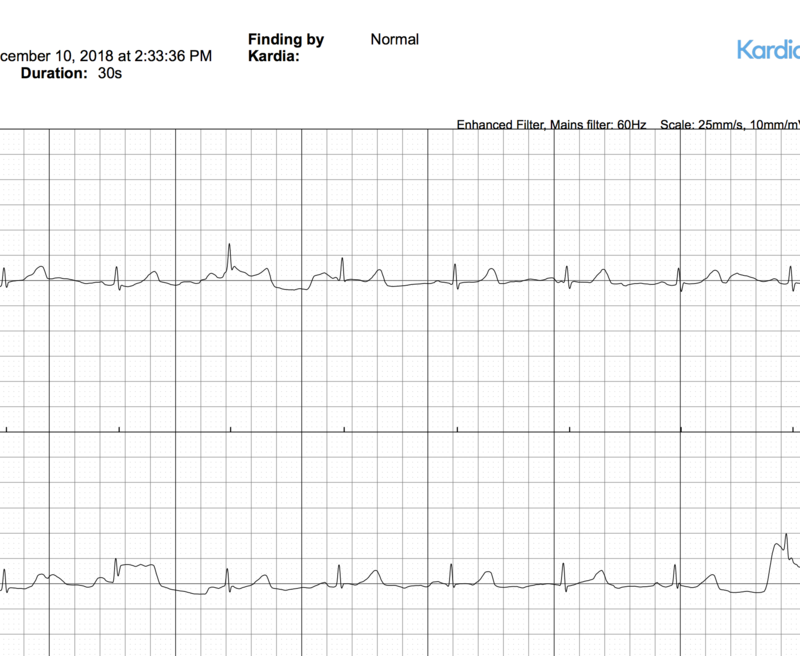 A second patient with afib who had elected not to acquire an AliveCor ECG device showed up for his cardioversion on Tuesday and after evaluating his rhythm it was clear he had spontaneously reverted back to NSR. Prior to my adoption of KardiaPro this was a common and scenario. The third scheduled cardioversion of the day showed up in afib and we successfully cardioverted him back to NSR. I had not addressed utilizing AliveCor with him. Prior to the procedure he asked me about likely outcomes. My standard response to this question is that we have a 99.9% success rate in converting patients back to NSR at the time of the cardioversion. 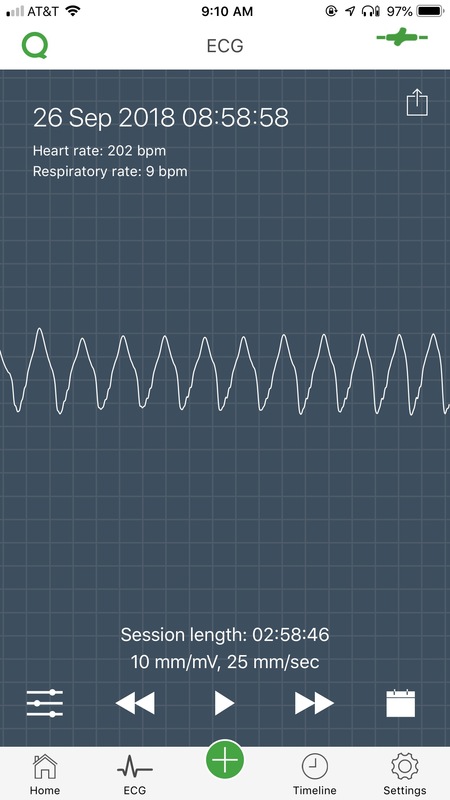 However, I can’t predict how long you will stay in NSR after the cardioversion. NSR could last for 5 days or it could last for 5 years. Adding medications like flecainide or amiodarone can significantly reduce the risk of afib recurrence after cardioversion. At this point he asked me “How do I know if I am in afib?” Whereas many afib patients immediately feel bad and are aware that they have gone out of rhythm, this man like many others was not aware. After the cardioversion we repeated the Alivecor recording and the rhythm (AliveCor’s interpretation) had changed from afib to NSR. Needless to say, this patient purchased a Kardia device the next day and since the cardioversion he’s made a daily recording which has confirmed NSR. I just logged into Kardia Pro and sure enough he made a recording last night and it showed NSR. Later in the week I received a call from a patient I had electrically cardioverted a few days earlier. His Kardia device had detected that he had gone back into afib. I logged into my Mac and saw his KardiaPro chart below. Kardia Pro displays green dots corresponding to NSR and orange triangles corresponding to afib with 100% accuracy in this patient. With perfect precision KardiaPro had verified NSR after the cardioversion lasting for 36 hours. For some reason after dinner the day after the cardioversion, the patient had reverted back to afib. This knowledge greatly facilitates subsequent treatment and eliminates the need for in office ECGs and long term monitors. Utilization of the Kardia device with the Kardia Pro monitoring service has proved for me to b a remarkable improvement in the management of patients with afib. Managing non Kardia afib patients feels like navigating a forest with a blindfold. I have a few patients who balk at the 15$ per month charge for Kardia Pro and ask why the device and this monthly charge aren’t covered by insurance or Medicare. Given the dramatic reduction that I have noticed in my use of long-term monitors as well as office and ER visits in this population, CMS and third-party insurers would be wise to explore Kardia monitoring as a more cost-effective way of monitoring afib patients. N.B. I realize this post appears to be an unmitigated enthusiastic endorsement of a commercial product which is quite uncharacteristic for the skeptical cardiologist. One might wonder if the skepcard is somehow biased or compensated for his endorsement of Kardia. 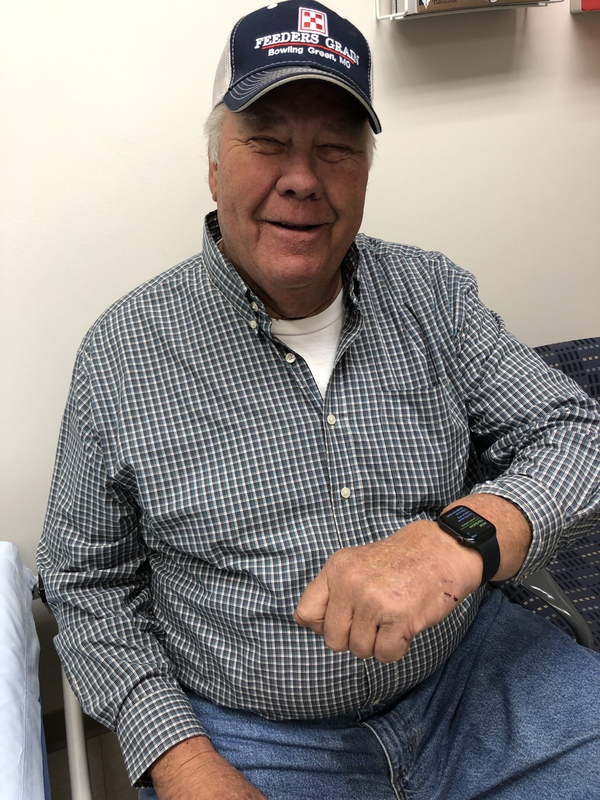 One of my patients has been on the cutting edge of personal cardiac monitoring devices and I asked him to share his recent experience with the QardioCore ECG strap. What he sent me is a fascinating description of how the device works (which is unique in this area) along with how it was crucial in diagnosing the cause of his recent symptoms. I’m sharing it below. “QardioCore is a clinical-quality wearable electrocardiogram recorder. An electrocardiogram – often abbreviated as ECG or EKG – is a test that measures the electrical activity of the heart. With each heart beat, an electrical impulse (or “wave”) travels through the heart. This wave causes the muscle to squeeze and pump blood from the heart. An ECG gives two major kinds of information. First, by measuring time intervals on the ECG, a doctor can determine how long the electrical wave takes to pass through the heart. Finding out how long the wave takes to travel from one part of the heart to the next shows if the electrical activity is normal or slow, fast or irregular. Second, by measuring the amount of electrical activity passing through the heart muscle, a cardiologist may be able to find out if parts of the heart are too large or are overworked. During an ECG, several sensors, called electrodes, capture the electrical activity of the heart. QardioCore is ideal for health conscious individuals or those with known or suspected heart conditions to record their everyday ECGs, physical activity, sport performance and medical symptoms and share their data with their doctors. Medical professionals can use QardioCore to quickly assess heart rate and rhythm, screen for arrhythmias, and remotely monitor and manage patients who use QardioCore. Unfortunately, the US FDA tends to move slowly, and we can only speculate as too why, but the device is not available for purchase here. However, I found a friend in France who purchased one for me and shipped me the device. It is not illegal for me to use the device here, but it is not allowed to be sold here in the US. I use an Apple I-Phone 8Plus and have used both the AliveCor KardiaBand and the KardiaMobile found here (https://store.alivecor.com), and reviewed by the esteemed Skeptical Cardiologist in other posts as well. While I find it as a useful tool, my only dissatisfaction is that I want to passively monitor my heart during sporting activities and look for rhythm disturbances. While I’m no expert in either sporting activities or rhythm disturbances, I’ve completed some healthy reading and living on both subjects and have a general awareness of the topic. The QardioCore device is simple to wear, comes with three belts that can be used and cleaned, and comes with a charging cable. Everything that the app, and the product does, seems to be accurately described on their web site, so I won’t cover off on details here. You can read more about it at this link: https://www.getqardio.com/qardioapp/ My only dissatisfaction with this device, and other blue tooth devices, has nothing to do with the device itself. Apple seems to randomly disconnect from Bluetooth devices with their phones. I don’t pretend to know the specific mechanisms for the problem, but my blue tooth devices for bicycling, music headsets, and heart monitoring have all been plagued with intermittent blue tooth connection problems. So, at times, I find myself having to restart their app to keep the device connected, which is a minor annoyance. I also use the QardioArm product to measure and monitor my blood pressure and am satisfied with it as well. What follows is my anecdotal experiences of September 26, 2018 through the present day and I agreed to write about them here, in case it provides useful insight to others in some way. 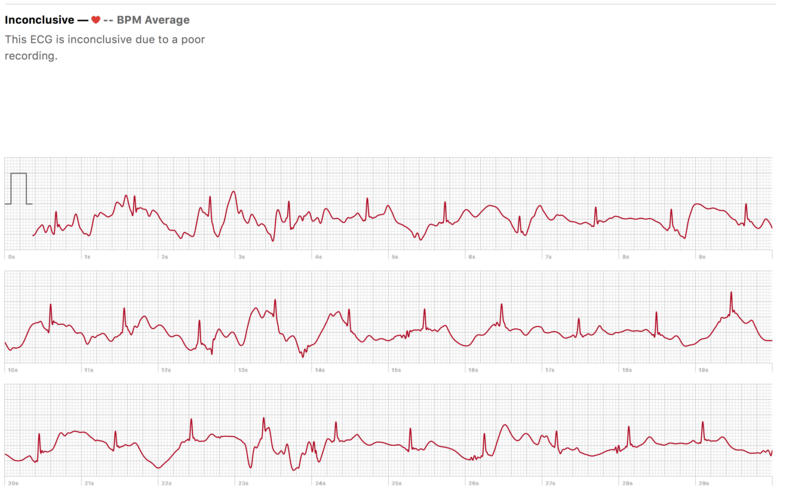 As a person with a short-term history of heart problems, I tend to capture a lot of data with my devices. 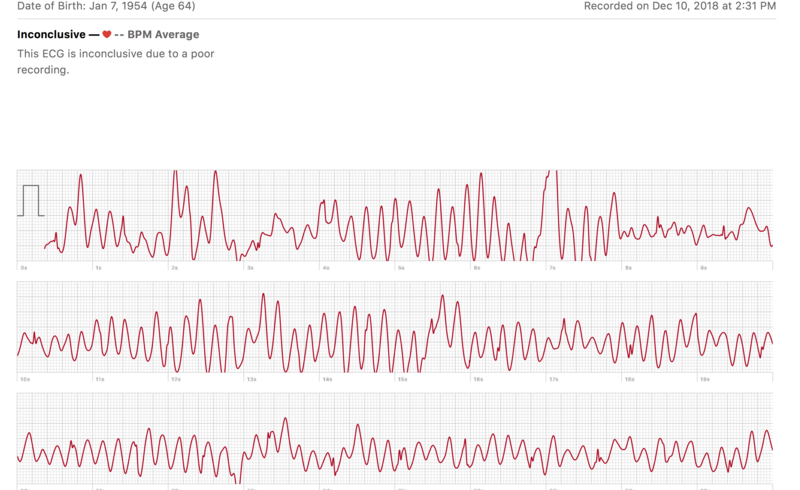 I monitor things like heart rate variability, blood pressure, Alivecor Kardia readings, sleep history, etc. I make an active attempt to monitor my levels of stress, but I know for certain that I lead a stressful life. I work longer hours than I should, probably sleep less than I should, exercise less than I like and should, and medicate and pray far less than I should. 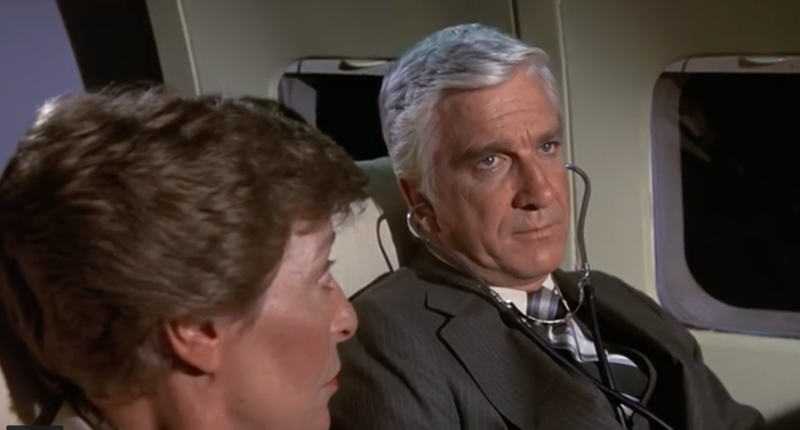 So, I don’t want to imply that anything that happened is the fault of the medical system, bad blue tooth connections, bad medical care, or bad advice from the Skeptical Cardiologist or any other medical professional. I tend to listen well, learn well, but I don’t always act as I should. But, I’m responsible for my choices, my decisions, and I live with the results of my actions. I believe this tool is valuable in many ways, but I believe that it was helpful for the Skeptical Cardiologist, as it helped narrow our focus of blood tests, scans, and potential procedures to run in a faster than normal basis. Normally, if I had not had evidence (accurate or not), I would have had to schedule an appointment, or go to ER. At that point, they would have either ordered an event monitor for me to wear while I was away from the hospital, or they would have had to admit me. Since I had a past history of Atrial Fibrillation, which isn’t quite as serious, we would have been sent home with an event monitor and instructions to take it easy and continue to take meds. We would have run more blood work, and more scans, but the point is that we would have been more broadly focused, as we would have had to generally guess as to the nature of the event and narrow it down. I recognize that this is one of the controversies that is active in clinical cardiology, as I listen to podcasts by Dr. John Mandrola and others regarding the latest cardio devices, procedures and research. I realize that many Cardiologists are not in favor of devices like these, because they lead to uninformed conclusions, which leads to unneeded stress on both patients and their stressed-out doctors and cardiologists. I’ve listened to both sides of the argument, and I have my own opinions that I won’t express here. I will just say that I believe that this device saved me time, possibly my life (as I don’t know what I don’t know, unless I know to look), and some time in hastening and narrowing my therapy choices. I will say that my wife and I were extremely happy with the services provided by his staff, himself, his colleagues, and the hospital staff as well. While I am confident I may be considered a difficult patient by some, or many, they were very thorough and kind in their treatment and explanation of my treatment options. I hope that my experience adds helpful insight to the discussion. I’m confident that the Skeptical Cardiologist will add to this post, with his views on the events I’ve discussed above. And, I believe he appreciates having a Skeptical Patient every now and then as well. As The Skeptical Patient wrote, this device is not sold in the United States. Having seen it in action now, I’m eager to get my hands on one and evaluate it further. It could dramatically alter home arrhythmia monitoring. For this patient it was incredibly helpful. If any of my European or Australian readers has experience with it please let me know. 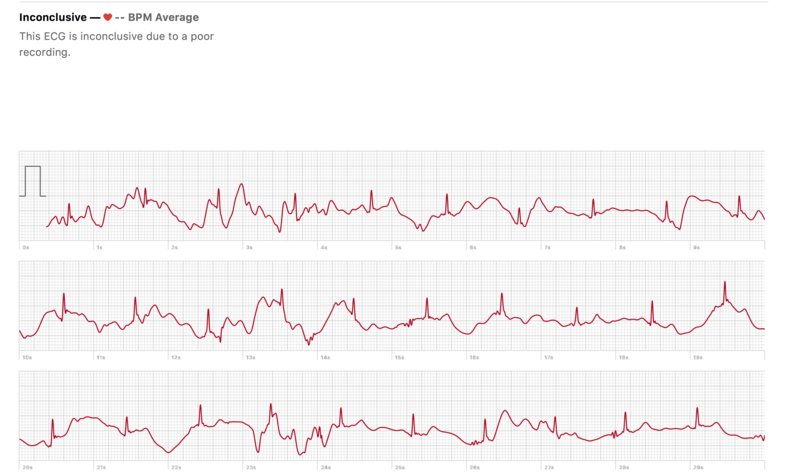 Qardio makes a stylish, accurate and portable home BP monitor that I’ve written favorably about here. N.B. Featured image of man running on beach with QardioCore is not of my patient. My New Apple Watch 4 Is Nice: But It Won’t Record ECGs or Work With KardiaBand! The skeptical cardiologist picked up an Apple Watch 4 at the Galleria Apple Store in St. Louis today. The Apple employee who retrieved it told me that ECG recording capabilities were expected in the fall. Of course fall began today and it is not at all clear when, if ever, Apple will provide the software update to its AW4 that will provide ECG capabilities. Fortunately, consumers already have the capability of recording a medical grade single lead ECG with any Apple Watch 2 or 3-using the KardiaBand from AliveCor. Apple has hubristically proclaimed the AW4 as the ultimate guardian of our health and while setting it up I was asked if I wanted the watch to notify me if my heart rate dropped below 40 bpm for 10 minutes. Sure! Let’s see how irritating this feature will be. After setting up the new watch I immediately attached my KardiaBand and installed the Kardia Apple Watch app. I was able to open the Kardia app and it performed its normal SmartRhythm monitoring but when I tried to record an ECG, alas, nothing happened. 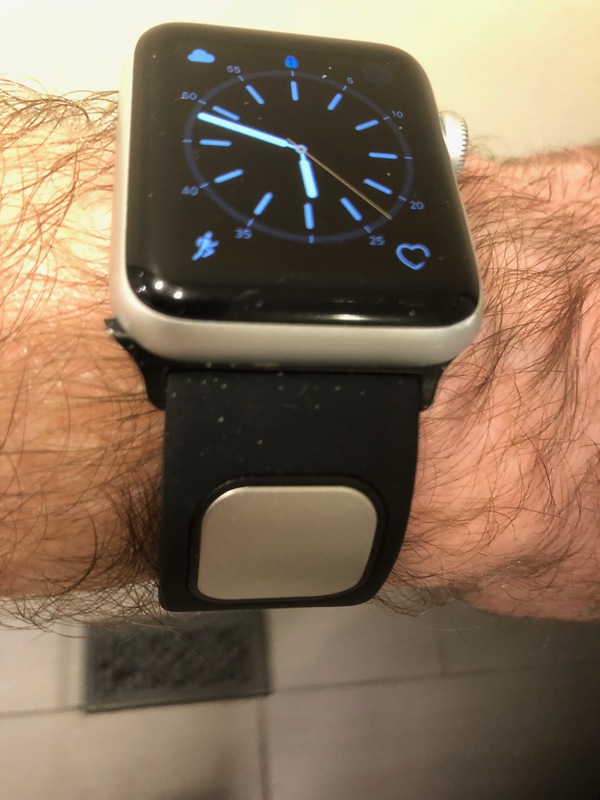 It appears that the KardiaBand does not work with the new Apple Watch 4. Yet. On February 10, 2014 AliveCor, Inc. announced that its heavily validated personal mobile ECG monitor had received FDA over-the counter clearance. Previously the device, which allows recording of a single-lead ECG and, in conjunction with a free smart-phone app, can diagnose atrial fibrillation was only available by prescription. This seemed blatantly inaccurate as AliveCor’s device clearly preceded by 4 years Apple’s claim. 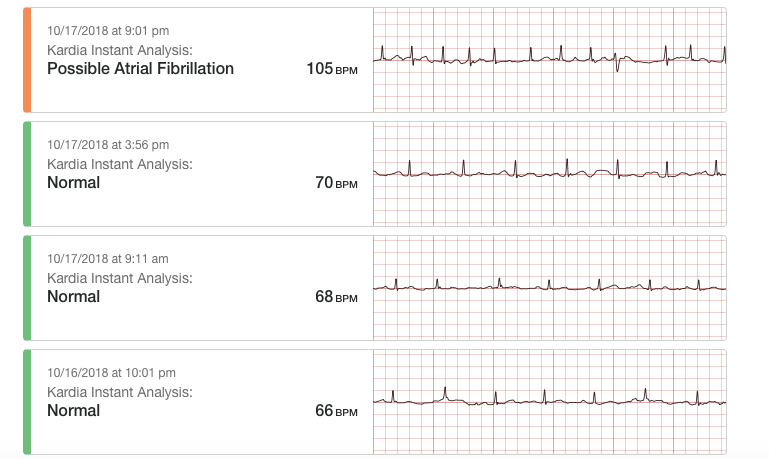 Furthermore, AliveCor’s Kardia Band which converts any Apple Watch into a single-lead ECG (which I’ve written about here and here) has been available and providing the Apple Watch-based ECGs since November 30, 2017. AliveCor has an outstanding website which documents in detail all the research studies done on their products (there are dozens and dozens of linked papers) and all of their press releases dating back to 2012. It also explains in detail how the product works. 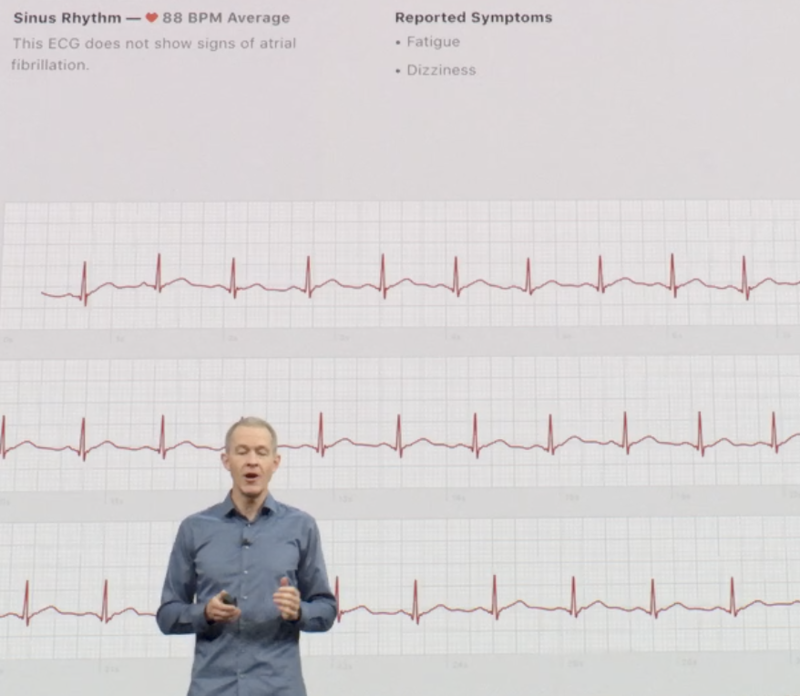 AliveCor shortly thereafter (December 12, 2017) announced Smart Rhythm , an Apple Watch app that monitors your rhythm and alerts you if it thinks you are in atrial fibrillation. I’ve discussed Smart Rhythm here. 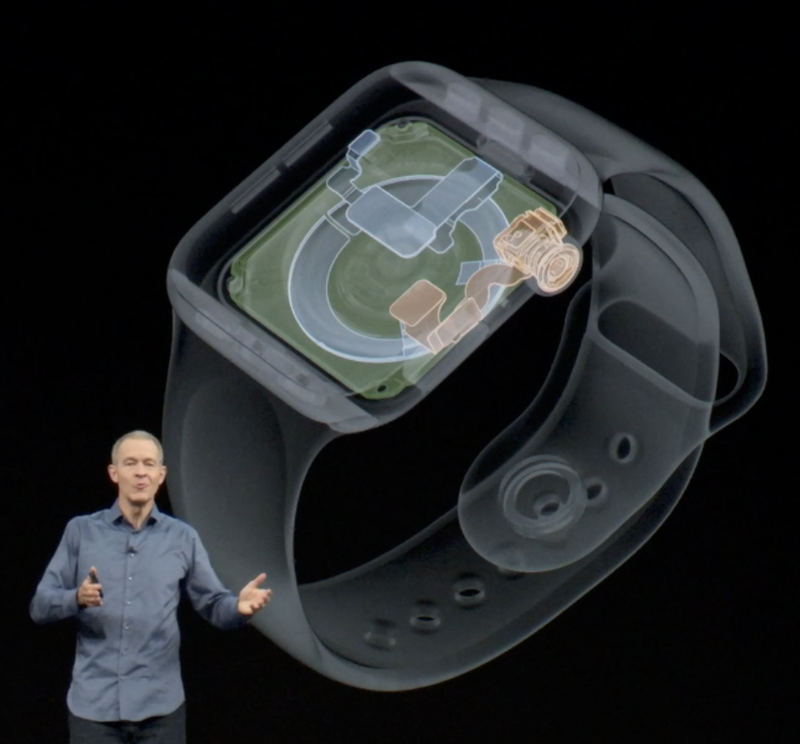 Apple’s Watch will tell you that you are not in atrial fibrillation. Given that we don’t know how accurate it is, should that be reassuring? The new Apple Watch’s rhythm monitoring app sounds a lot like Smart Rhythm but without any of the documentation AliveCor has provided. So, within 10 months of Alivecor providing the world with the first ever wearable ECG (and proven its accuracy in afib) Apple seems to have come out with a remarkably similar product. The major difference between Apple and AliveCor is the total lack of any reviewable data on the accuracy of the Apple device. Yes, that’s right Apple has provided no studies and no data and we have no idea how accurate its ECG device is (or its monitoring algorithm). For all we know, it could diagnose sinus rhythm with frequent APCS or PVCs consistently as atrial fibrillation, sending thousands of Watch 4 wearers into a panic and overloading the health care system with meaningless alerts. Apple’s “momentous achievement” was actually achieved 10 months earlier by AliveCor and if its monitoring algorithm and ECG system are significantly worse than the proven AliveCor system they will be destroying the peace of mind of users. Electrodes built into the Digital Crown and the sapphire back crystal allow sensing of cardiac electrical signals. Did Apple get this idea from AliveCor? Does Benjamin have access to the accuracy of the Apple Watch ECG sensor? If so, he and the AHA should immediately share it with the scientific community. If not, by endorsing this feature of the Watch he should be ashamed. Users need to know if he or the AHA was paid any money for this appearance. Also, we should demand to know if (as the prominent AHA logo suggested and news reports implied) the AHA is somehow endorsing the Apple Watch. Frequent readers know I’m a huge Apple fan but this Apple Watch business makes me think something is rotten in the state of Apple. 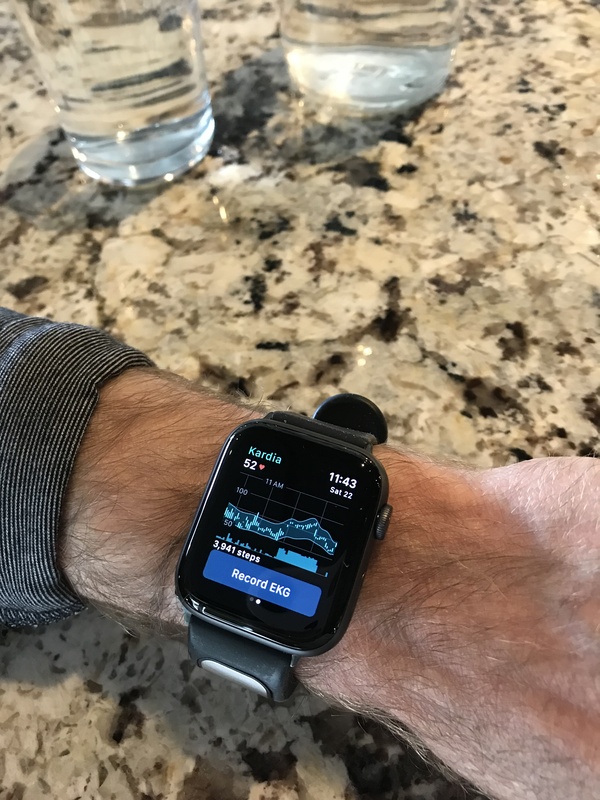 As I described here, the Kardia Band (KB) is an FDA-approved Apple Watch accessory available to the general public without a prescription which records a high quality single-lead ECG. 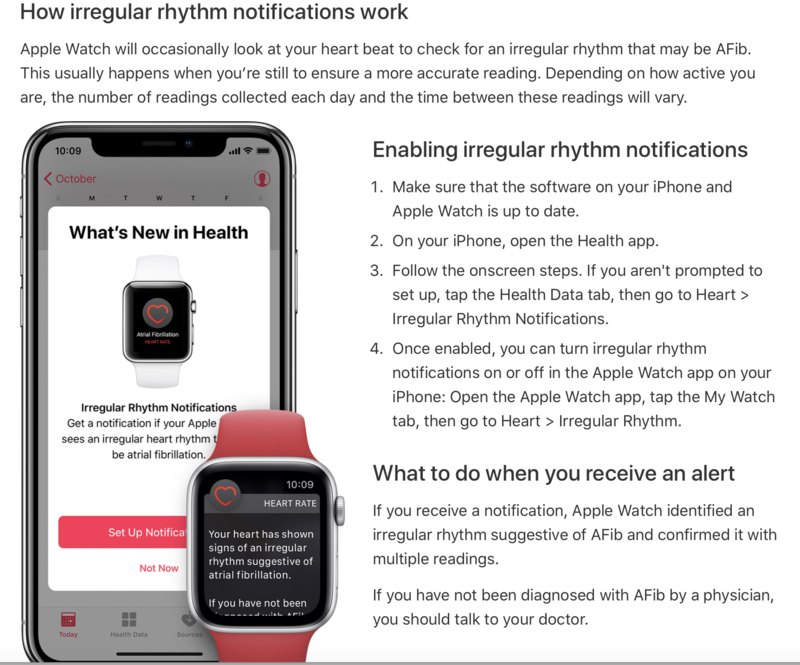 Once the 30 second recording is completed, the Kardia app on the Apple Watch takes about 5 seconds to process the information using an AI algorithm and then makes a determination of normal sinus rhythm (NSR), atrial fibrillation or unclassified. In the JACC study, investigators from the Cleveland Clinic studied 100 consecutive patients presenting for cardioversion from AF with recordings made before and after the procedure. KB interpretations were compared to 12 lead ECGS read by electrophysiologists. KB interpretations identified AF with 93% sensitivity and 84% specificity. Of the total 169 recordings, 34% were unclassified due to short recordings, low-amplitude p waves, and baseline artifacts. The authors concluded that the KB algorithm for AF detection, when it is supported by a physician review can reliably differentiate AF from NSR. For each of these patients, the automated KB algorithm did not erroneously identify AF, and the physician interpretation of the KB recording correctly confirmed SR in each case. Needless to say, it is better to find out a cardioversion is not needed before the patient shows up for the procedure. I would estimate this happens about 5-10% of the time in my practice. The Kardia device or the KB is also really helpful post cardioversion. If the patient makes daily recordings (which I can review on Kardia Pro online) h/she and I know exactly how long sinus rhythm persisted before reverting back to AF. This is important information which impacts future management decisions. None of my patients have purchased the Kardia Band most likely due to the cost and the fact that they don’t have an Apple Watch. 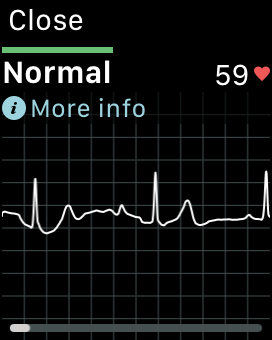 If you have an Apple Watch and want to monitor your heart rhythm I think the KB is a good choice. Otherwise, the original AliveCor mobile ECG device continues to do a fantastic job (in conjunction with Kardia Pro, see here). The combination of Kardia and Kardia Pro has substantially reduced my use of expensive and annoying long term monitors in my AF population. In my next update on the KB I will share a reader’s real world description of the pros and cons of the KB (with Smart Rhythm monitoring) in a patient post cardioversion for AF. Four years ago the skeptical cardiologist wrote a post which outlined the reasons why most people should avoid getting a routine annual electrocardiogram. (for asymptomatic adults at intermediate or high risk for CHD they deem the evidence insufficient). The USPSTF feels that that the evidence only supports an annual BP screen along with measurement of weight and a PAP smear. The U.S. Preventive Services Task Force (USPSTF) recommends against preventative screening with resting or exercise electrocardiography (ECG) in asymptomatic adults at low risk of cardiovascular disease events in an updated recommendation statement published June 12 in the Journal of the American Medical Association (JAMA). I should point out that I still believe (although some would disagree) screening for atrial fibrillation with methods other than a 12-lead ECG (including taking the pulse or checking a single lead ECG with a Kardia device) is worthwhile. Below, I’ve reposted relevant sections of my 2014 post which emphasizes the problem of false positives and false negatives which are quite frequent with any screening test but are particularly worrisome with the routine 12-lead ECG. To many, this seems counter-intuitive: how can a totally benign test that has the potential to detect early heart disease or abnormal rhythms not be beneficial? There is a growing movement calling for restraint and careful analysis of the value of all testing that is done in medicine. Screening tests, in particular are coming under scrutiny. Even the annual mammogram, considered by most to be an essential tool in the fight against breast cancer, is now being questioned. In my field of cardiology there is much testing done. It ranges from the (seemingly) benign and (relatively) inexpensive electrocardiogram to the invasive and potentially deadly cardiac catheterization. For the most part, if patients don’t have to pay too much, they won’t question the indication for the tests we cardiologists order. After all, they want to do as much as possible to prevent themselves from dropping dead from a heart attack and they reason that the more testing that is done, the better, in that regard. But all testing has the potential for adverse consequences because of the problem of false positives and negatives. To give just one example: ECGs in people with totally normal hearts are regularly interpreted as showing a prior heart attack. This is a false positive. The test is positive (abnormal) but the person does not have the disease. False positives lead to unnecessary worry, anxiety, and testing. More testing is highly likely to be ordered; specifically, a stress test. Stress tests in low risk, asymptomatic individuals often result in false positive results. After a false positive stress test, it is highly likely that a catheterization will be ordered. This test carries potential risks of kidney failure, heart attack, stroke and death. It is bad enough that the cascade of testing initiated by an abnormal, false positive, screening test results in unnecessary radiation, expense and bother but in some cases it end up killing patients rather than saving lives. On the other end of the spectrum is the false negative ECG. Most of my patients believe that if their ECG is normal then their heart is OK. Unfortunately the ECG is very insensitive to cardiac problems that are not related to the rhythm of the heart or an acute heart attack. Patients who have 90% blockage of all 3 of their major coronary arteries and are at high risk for heart attack often have a totally normal ECG. This is a false negative. The patient has the disease (coronary artery disease), but the test is normal. In this situation the patient may be falsely reassured that everything is fine with their heart. The next day when they start experiencing chest pain from an acute heart attack, they may dismiss it as heart burn instead of going to the ER. More and more, screening tests like the ECG and the mammogram are rightfully being questioned by patients and payers. For a more extensive discussion about which tests in medicine are appropriate check out the American Board of Internal Medicine’s http://www.choosingwisely.org. Keep in mind: not uncommonly, doing more testing can result in worse outcomes than doing less. h/t Jerry , the life coach of the skeptical cardiologist , who originally posed this question to me. 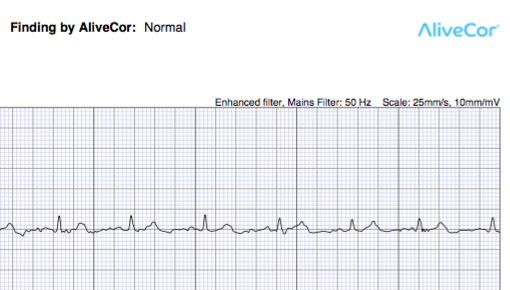 Sometimes AliveCor’s Mobile ECG device yields unclassified interpretations of recordings. Understandably if you want to know whether your rhythm is normal or atrial fibrillation, the unclassified classification can be very frustrating. There are various caues of an unclassified tracing with different solutions. Some unclassified recordings are due to a heart rate over 100 BPM or under 50 BPM and cannot be fixed. Similarly, some patients with ectopic beats like PVCS may consistently generate unclassified interpretations (see my discussion here). Artifacts induced by poor recording techniques are common as a cause and almost always can be fixed. 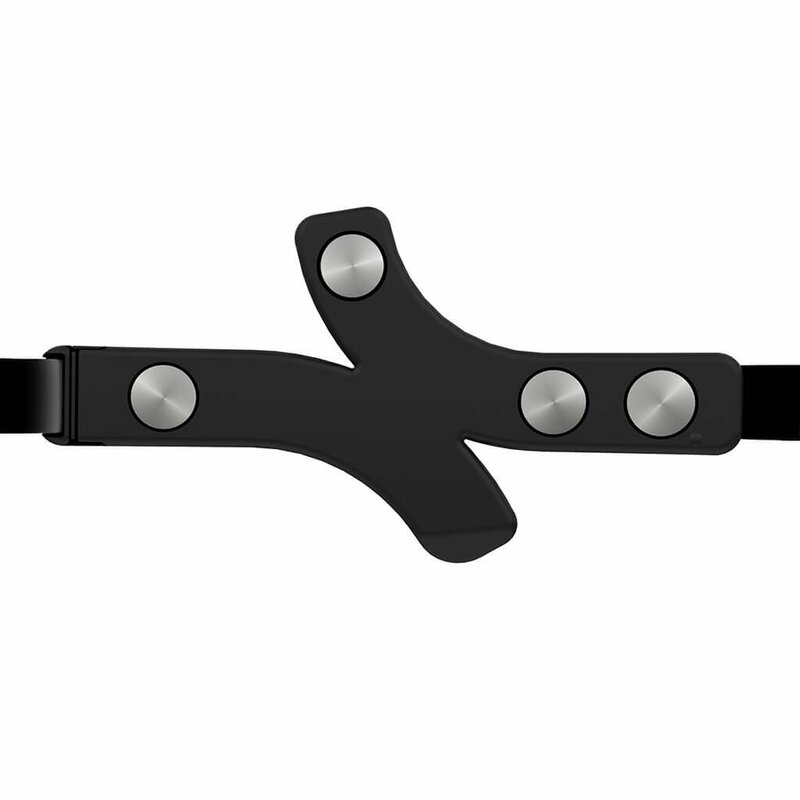 These can be reduced by minimizing motion, extraneous noise, and maximizing contact with the electrodes. Follow all the steps AliveCor lists here. And be aware the device needs to be near the microphone of your iPad or smartphone. Another cause of unclassified interpretations is a low voltage recording (which I initially discussed here.). At the recent ACC meeting I asked Alivecor inventor and CEO David Albert if he had any solutions to offer for those who obtain unclassified low voltage AliveCor tracings. He told me that the cause is often a vertically oriented heart and that recording using the lead II technique can often solve the problem. 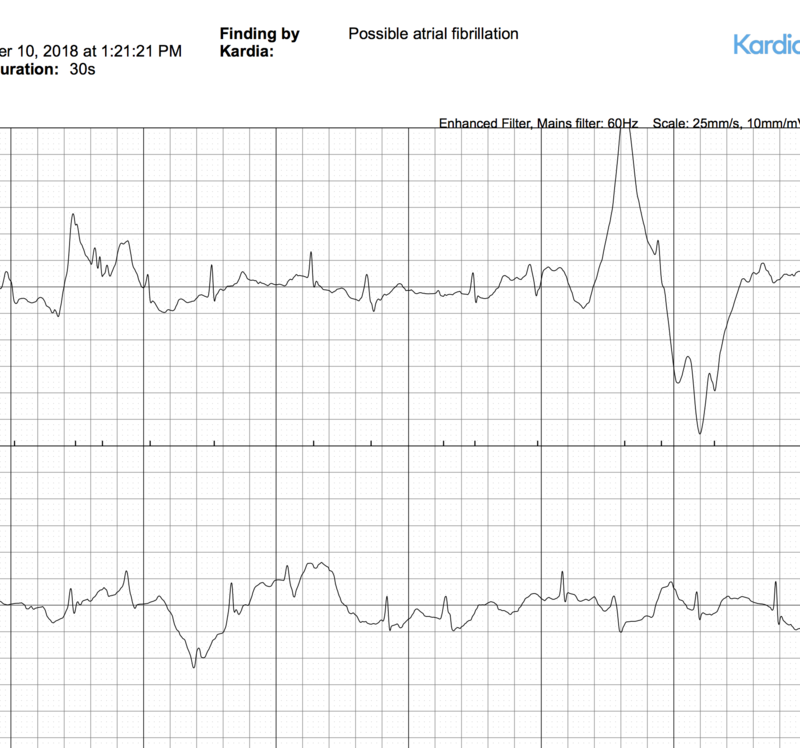 Reader “J” recently sent me a series of Kardia ECG recordings, some of which were unclassified , some normal and one read as possible atrial fibrillation. They were very regular with a rate between 80 and 100 BPM but they totally lacked p waves. It was not clear to me what the rhythm was on these tracings. For an Anterior Precordial Lead, the device can be placed on the lower left side of the chest, just below the pectoral muscle. The bottom of the smartphone or tablet should be pointing towards the center of the body. There is an abnormal cardiac rhythm that is regular between 80 and 100 BPM with no p waves and normal QRS called junctional tachycardia but in J’s case the absent p waves are related to the recording site. Also, note that for this young woman the lead II voltage (Type B tracing) is much higher than the standard, lead I voltage (type A tracing). After Dr. Albert told me of the advantages of Lead II I responded that it seemed somewhat awkward to take one’s pants off in order to make an ECG recording. He immediately reached in his suit pocket and pulled out a pen-shaped device and began spraying a liquid on his left knee. To my surprise he was able to make a perfect Lead II recording without taking his pants off!